There are so many special qualities that make her, "her", so why not make sure she knows? This complimentary personalized Word Cloud photo frame for women proclaims a variety of feminine, positive characteristics that praise her mind, body and soul. 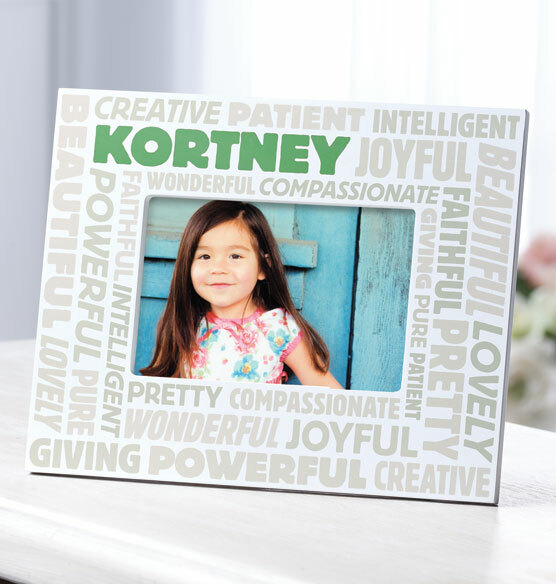 The selection of words on the personalized picture frame are printed in a pleasing variety of font types and colors, and are appropriate for women of all ages. Who wouldn’t want to look at this frame and be reminded that you find her lovely, creative and more? The back has both an easel stand and sawtooth hangers so she can display it on a table or wall. Makes a perfect gift idea for a special woman in your life. The adjectives on this frame say so well what I feel about this person.